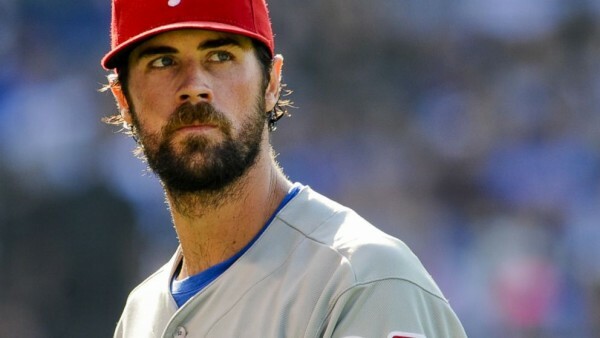 The biggest name heading into the trade deadline is off the market, as the Philadelphia Phillies engage in a massive trade deal with the Texas Rangers and finally get rid of Cole Hamels and his massive salary, not without picking up an impressive amount of prospects. Hamels, 31, is guaranteed $70.5 million through the 2018 season, and there’s a team option of $20 million or $24 million vesting option for 2019. The Phillies have been engaged in talks for the three-time All-Star and 2008 World Series MVP with a lot of teams, but while some backed off, the Rangers finally came through with a deal that made the Phillies happy. So who’s going where? Five prospects – catcher Jorge Alfaro, outfielder Nick Williams, and pitchers Jake Thompson, Alec Asher and Jerad Eickhoff – along with left-hander Matt Harrison are expected to go to Philadelphia. Hamels isn’t going alone to Arlington, joined by some cash and left-handed reliever Jake Diekman. The Rangers managed to keep their top two prospects, Nomar Mazara and Joey Gallo and center fielder Lewis Brinson. The Phillies got two top 100 prospects in return and also veteran lefty Matt Harrison who has thrown just 43 innings since 2012, and is still owed $28 million over the next two years if the Phillies buy him out before the beginning of the 2018 season. Overall, they’ve made a massive upgrade to their farm system, which just might be the way out of their miserable situation. Hamels wasn’t traded because he was a bad player. He still is one of the best pitchers in baseball, but he was also the best asset the Phillies had on their team which was going nowhere. It didn’t make any sense to keep him in their current situation, now getting a boost to carry on with their rebuild. The Texas Rangers didn’t add Hamels to win now, but rather next season. Their rotation has been the most injured in baseball over the last three seasons, using 27 different starting pitchers, more than anyone else in the American League. Their starting rotation has a 4.43 ERA in 2015, 25th in baseball. Their strikeout percentage of 15.2% is the worst in baseball. Hamels doesn’t have scorching speed on his fastball, but he has fantastic control and a wide variety of pitches. He seems to be in the mold of pitchers who do well into their 30’s, not relying on speed and power. Over the past six seasons, Hamels’ 3.07 ERA is the fourth-best in baseball, 1.13 WHIP is fifth-best and .234 opponent BA is sixth-best, among pitchers with at least 1,000 innings pitched.